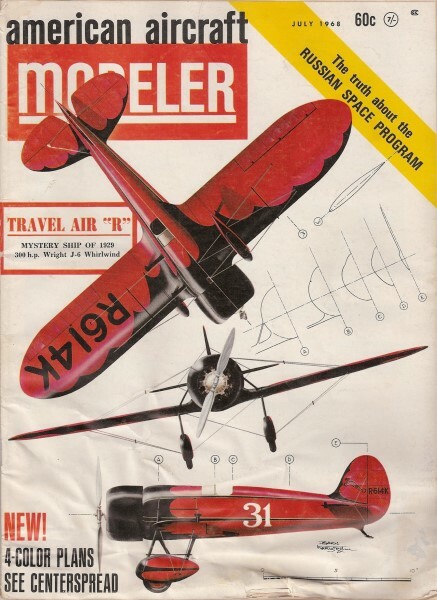 This article on the Ryan S-C appeared in the July 1968 edition of American Aircraft Modeler. 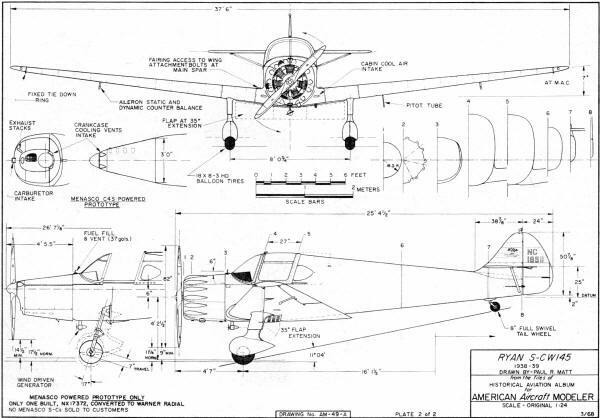 The S-C was unique in many ways, the least of which was its monocoque construction throughout - wing, tail surfaces, and fuselage. Its production, certain to be a hit, was abruptly halted after just 10 production models due to WWII requiring the factory be used for military aircraft. Here is a great resource for the Ryan S-C.
A trend setter that looks as modern today as it did 30 years ago. SHE was a beautiful ship, just as beautiful and easy to fly, too - you knew it was a trend setter, and those few that are still flying look just as modern and at home today as they did 30 years ago." So stated a pilot recently who had considerable time on the Ryan S-C shortly before WW II and for a couple of years after. To this we can add that the S-C was more than a trend setter in its class; it was the first truly successful private plane to pioneer the all-metal, low-wing, enclosed-cabin concept. A plane that had everything going for it if a nasty war had not intervened and halted production. 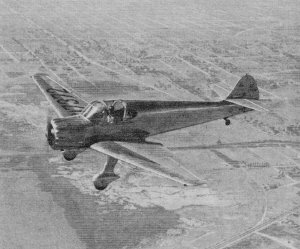 The 145-hp Warner-powered Ryan S-C prototype flies over San Diego Bay shortly after conversion from in-lined configuration. Warner 145-hp radial proved more reliable, rugged, easier to maintain. Only 12 S-CW's built before military contracts interfered. Test pilot John Fornasero runs up the engine for first flight in early 1937. The design called for 95- to 150-hp Menasco engines. T. Claude Ryan envisioned the S-C (Sport Cabin) in 1936. Later, in a resume about its development, he expressed his hopes, intentions and requirements. "The plane was planned from the first preliminary drawing as a production job," he stated. "We wanted to develop a type of construction so simple and so practical that it would lend itself to efficient manufacture in much larger quantities than had been customary in the past. "Aircraft designers have for years toyed with the idea of airplanes stamped all at once in one huge press, or poured out of some synthetic material in a single molding operation, or somehow fabricated so as to avoid the tedious hand fitting of limitless numbers of small parts. We believe that in the development of the S-C we approached this ideal of the one-piece airplane. "It is a much more difficult assignment to simplify a structure than to 'complexify' it," he went on, "We feel it (the S-C) is the most simply manufactured metal airplane and the most adaptable of any yet developed to an efficient production machine." Ryan achieved the classic S-C through two years of extensive study, experiment and ingenuity. Every part, with few exceptions, was either a flat sheet or a drop-hammer stamping. Flat sheets were marked and drilled from steel master templates, while stamped sheets were formed from dies which accurately reproduced a given part exactly over and over again. The only major compound curves were in the engine cowling, wheel pants and fairings. Nearly 90% of the structure and covering was of one gauge aluminum - 24ST. In producing the S-C a full-scale plaster model was built first. Once the shape was finalized, lines were transferred from the plaster mock-up directly to metal by means of progressive steps. Shells were built around the fuselage model at bulkhead points and a compound curve area. Plaster casts were then made and, from these female castings, master male plaster casts were made. The plaster patterns were used to make sand molds into which was poured molten zinc metal, thus forming one half of the die. The "punch" or female half of the die was made by pouring lead directly over the zinc die. 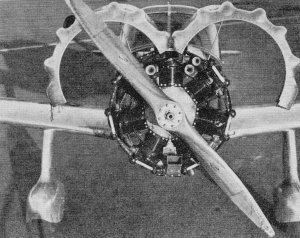 The complete S-C was built up of a little more than 200 individual sets of dies from which all the essential parts of the plane's structure was formed. The wing structure was greatly simplified and its construction of great interest. Again, the precision of the drop-hammer die-stamping process was utilized. 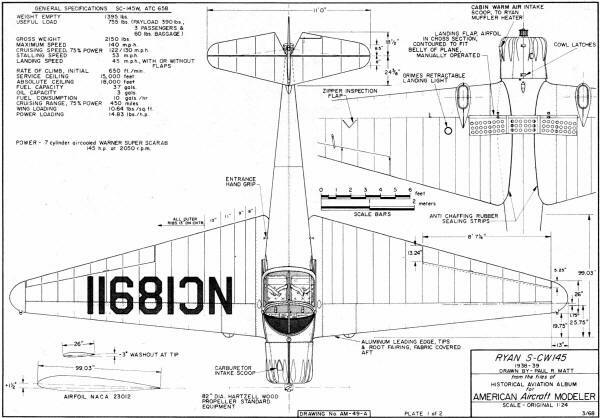 The wing featured the monospar principle and each panel was attached to the fuselage by three taper bolts. The spar did not run as one unit throughout the span. This metal "monocoque spar," as it was termed, was a Ryan patented development. In reality, the spar embodied approximately the full forward-third portion of the wing. This nose portion was assembled as a single unit with major stresses carried by the outer skin. It was further stiffened by the nose ribs and single vertical webs located about one-third of the chord. Thus, the entire forward portion of the wing formed a light but strong tapered box spar. The master spar swept back from root to tip about 1-1.2 degrees due partially to the 3-degree washout in the wing, to gain added structural strength as the wing thinned near the tip, and to retain the correct airfoil shape. This method of construction is known today as the "D" tube spar and is used on the popular Mooney. The wings were formed and assembled in one continuous operation in a master jig. The trailing portion was cantilever ribbed. From root to aileron, ribs were built up from drop-hammer formed cap strips and simple diagonal members. The outer ribs were stamped in one piece. Final assembly was completed on the master wing panel jig to assure alignment. The entire S-C was completely assembled and aligned on but three main jigs. These processes may seem commonplace today and in many cases old fashioned. 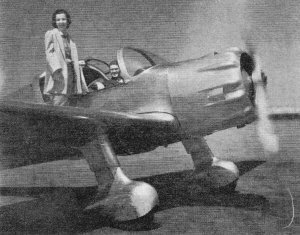 However, in 1936/37 such utilization of metal in a low-cost, private light plane was a great advance in aircraft design and construction. For its simple construction the S-C was beautifully streamlined and efficient. It quickly gained a reputation as just about the classiest private plane of its day. The Ryan was a remarkable plane, highly maneuverable, responsive to the controls under all conditions, yet stable enough to be flown hands off. Careful choice and use of the right airfoil provided a stable center of pressure which made the natural center of gravity coincide with the center of pressure throughout the wing. Tests showed the wing as near perfectly balanced and free from flutter under all conditions as possible. Stalls were mild, the nose dropping only slightly below the horizon and aileron control was positive throughout. Forced loops and spins were possible with the S-C's but they were placarded against any violent maneuver. They were not intended as aerobatic machines. Once the shape was finalized, lines were transferred from the plaster mock-up directly to metal by means of progressive steps. Shells were built around the fuselage model at bulkhead points and at compound curve areas. Plaster casts were then made and, John Fornasero did the initial flight test work. He was also chief test pilot for Ryan on the ST series. The S-C was originally designed to employ the complete line of Menasco inline air-cooled engines, ranging from the 95-hp B-4, 125-hp C-4 and the 150-hp C-4S as optional customer choice. The prototype had the C-4S installed and proved most adaptable from the standpoint of operational costs versus performance compromise. Trials continued throughout the summer with the little aircraft turning in an ideal and enviable performance. The recorded facts and figures along with its sleek appearance made headlines in all the leading aviation journals. By late summer the S-C had received its ATC (No. 651) and the NX 17372 license was changed to NC. As fall approached, the S-C was put into service at the Ryan School of Aeronautics in San Diego. Here it served as a primary trainer, being used for indoctrination into the "first feel of flight." Several months later a re-evaluation of the S-C was undertaken. A review of upkeep costs, flight hours, maintenance problems, and what bearing these would have on the owner of such a plane, was made. The original S-C was brought back to the factory, the Menasco engine removed and a seven-cylinder Warner 145-hp radial installed. This change was dictated purely by engine studies and considerations by engineers. With the Warner engine, fuel consumption was only slightly less than with the Menasco but it proved more reliable, rugged, easier to maintain and cost less per unit to install. With the radial engine as power, the entire series of tests had to be carried out again and the only change found necessary was an added wing-to-fuselage fairing. This was done in order to retain spin characteristics for the airplane to be CAA certified. John Fornasero once again did the early flight work, but most of the later wringing out was done by Paul Wilcox, who succeeded Fornasero. The prototype now sported the S-CW designation and in October 1937 became NC 17372 all over again under ATC 658. Production tooling got underway immediately and material was procured for an initial lot of 25 aircraft with deliveries to start in the spring of 1938. S-C production was just underway when Claude Ryan announced a new contract for aircraft parts, putting the company in the position of having over $300,000 backlog of work. Within a few months of this, Ryan received overwhelming orders for the STM, military version of the ST trainer. These orders came in from the U. S. as .well as many foreign governments. Only 12 S-CWs were built before production had to be stopped in order to keep up with the more pressing military schedules. It was hoped the S-C could be brought back but, when war broke out, any possibilities of resuming commercial production was forgotten for the duration. Initial retail price for the standard S-C was $6,885 but with extra equipment, which most customers chose to have installed, the cost was around $7,500. No Menasco or inline powered S-Cs were delivered to customers. Only the NX prototype employed this engine for only a few months. 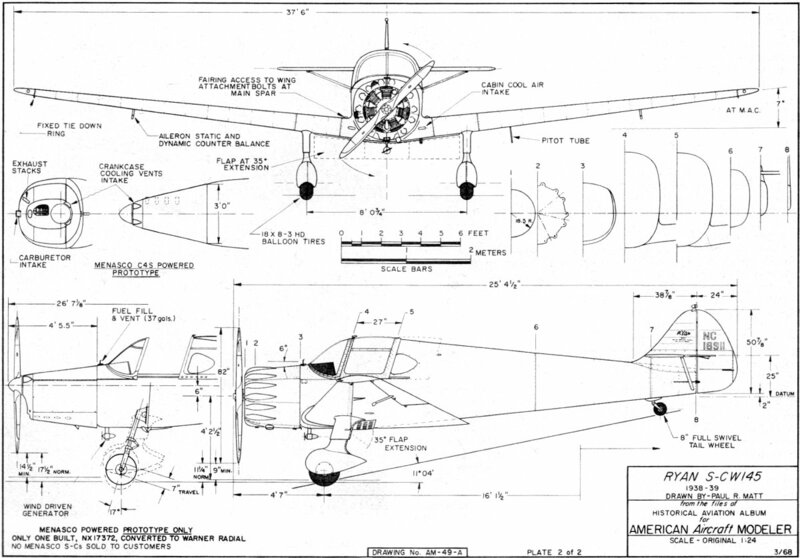 The Ryan S-C had a top speed of about 140 mph at 5,000 ft. and a cruising speed of 125 mph. Landing speed was 45 mph. The metal perforated landing flap, situated between the landing gears, attached at the main spar line and manually controlled by a lever in the cockpit, was effective in giving good glide control during approach but had little effect upon the plane's speed. It in no way changed the stability nor was there any correction necessary when it was extended. It also provided a slight assist in short takeoff runs. The sliding cockpit canopy could be adjusted in flight through intermediate positions between closed to fully open. No buffeting occurred and there was no change in trim necessary. Because of their similarity in planview, with long tapered wings, fixed spatted undercarriage and general silhouette, several Ryan S-Cs were used in war movies to represent early Japanese Nakajima fighters. Many S-Cs played their own war-time role in the hands of the C.A.P. and one has been unofficially credited with spotting and sinking or disabling of a German U-Boat off the Atlantic coast in 1942. Of the 12 S-C's built, one was sold to Brazil and one was flown to a customer in Mexico City. The other ten were initially purchased by customers in the U. S.
Considerable analysis was made after the war as to the economics of resuming production of the S-C model. 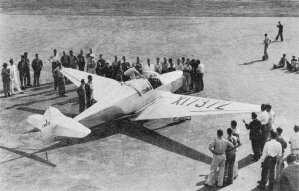 Two versions were to be offered, the standard S-C145W and an improved S-C165W model with the Warner 165-hp Super Scarab engine. However, when the opportunity arose to purchase the rights for the North American Navion, the S-C was abandoned. The S-C had a comparatively short production life but its appearance in the late 1930's will long be remembered as just about one of the classiest private planes to ever flex its wings in flight.